News out today per HERE regarding the current stage of negotiations with General Veloso over the return of licence 4623C in Mozambique is game changing news for long suffering shareholders in Pathfinder Minerals. Since the loss of the licence back in 2011 the company has endured a tumultuous period with placing after placing to fund inordinate legal costs. This now looks to be at an end, in part due to efforts on our part last year to replace ex CEO Nick Trew with a new team where the opportunity for a “reset” with the Veloso’s was presented. This now looks to be on the cusp of paying material dividends for shareholders. The announcement today details also a placing taken up in large part by ourselves and Directors and that provides adequate corporate costs for at least 6 months to progress to the all important licence return. As per the key para in the RNS – “In parallel, the Board is evaluating, and is in active discussions with regards to, potential funding strategies (including both partnerships and debt provision) to facilitate the Proposed Transaction and finance subsequent development of the Licence. Our focus as a Board is delivery of meaningful value to current shareholders minimising any future dilution.” this sends a clear and unequivocal message to shareholders that the BoD will not be carrying out a material equity raise at this level and is evidenced by the BoD participation in cash and salary conversion at the new base price of 2p together with new options that require a price of 2.5p in order to begin to make money. This is clearly intended to send a strong signal to the market where management see the stock price going. The element of the RNS detailing the scoping study update illustrates succinctly just what the prize is at hand with the NPV (at a 10% disc rate) moving from just over half a billion dollars to now over $1bn. 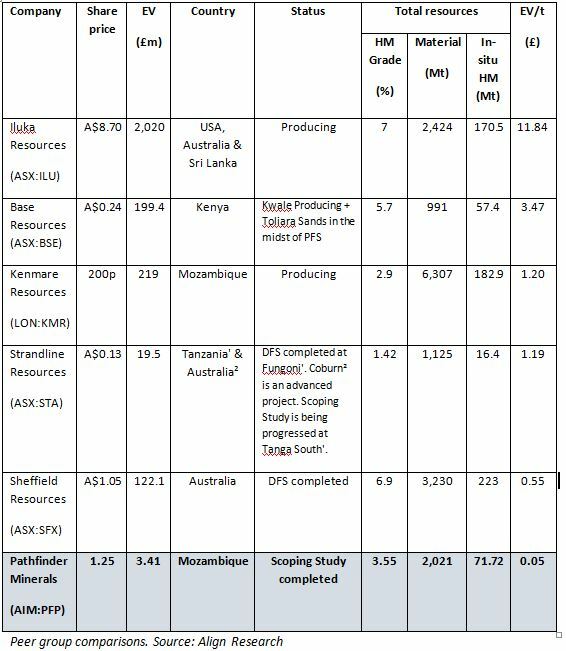 This truly is a world class asset and as the largest shareholders in the company we doubt that management will be short of potential partners, most likely at the project level and which dovetails with the point above re minimising dilution. We can foresee a scenario in which the company ends up with 30-50% of the asset as a free carry through inviting de facto farm ins. Set against a market cap of just £6m, under almost any scenario this looks woefully out of kilter with a risk weighted adjustment. Of course, Kenmare is the elephant in the room ref their adjacent operations and industry talk is that they need to do a deal in addressing their share price decline. PFP owning the licence outright again would, we posit, be a perfect fit in this scenario and we for one would happily take Kenmare’s paper. Management are now looking to close in on the residual 50% interest in the licence and we speculate that a timescale running into early summer is likely with regards to completing the SPA and getting the requisite Mozambique Ministry of Mines approval. This provides adequate time to put in place the most equity accretive purchase and partnership structure with the placing today providing runway into the autumn. We expect the journey from this point to be a rewarding one for shareholders based on the simple fact that at the new base placing price of 2p the company remains capped at just circa £6m. The table below highlights the disparity on an EV/t valuation v PFP’s peers and thus the potential upside pending final deal terms on the reabsorption of the licences. Consider that the stock was capped at approx £80m near 8 years ago when heavy mineral sands were a good degree lower than they are now then to us, the stock still remains priced purely as an option on the asset hence our participating in this placing and adding to our shareholding. Given terms having now been agreed with the Veloso’s and per the RNS HERE in which Africa Focus Grp in fact capitalises the company at £11.11m through their share subscription option ref the £1m fee on completion of the SPA for 100% ownership (this is now equivalent to 3.7p per share post dilution and, we believe, provides a realistic near term stock price target) together with management completely aligned with ourselves and other shareholders, we believe that the company has made a material step towards restoring meaningful shareholder value and that at the price of 2p they now present even more of a compelling opportunity on a risk/reward basis.